15 Jan :Viewing the Mumbai attacks as a "test" of India’s patience, Army Chief Gen Deepak Kapoor on Thursday said the country will use all "available options" to ensure security of its people and territory. Addressing officers and jawans on the 61st Army Day, he said India’s neighbours were facing challenges that could pose threat to the security of this country and in view of this forces needed to be vigilant. "The attack on Mumbai was a test of our patience," Gen Kapoor said.He maintained that India wanted to resolve its issues with Pakistan through peaceful means but had kept all options open to tackle the terror menace. "To ensure the security of our people and territory, we can use all possible available options," Kapoor said.Describing terrorism as "the only and biggest challenge" before the country, he said, "We are ready to face this challenge. "He said all neighbours of India were facing challenges, which could pose threat to the security of the country. "We have to remain vigilant against these threats if we have to progress and prosper," the Army chief said.He said army was always ready and capable of carrying out whatever task it is assigned by the government.Mentioning the global economic meltdown as the second biggest challenge faced by the world, he said the government didn’t want the financial proposals of armed forces to be impacted by recession and asked his officers to ensure full value for money spent on the armed forces. Noting that Pakistan has moved troops towards border with India, Army Chief General Deepak Kapoor said New Delhi has kept all options open, including the "fighting option" as a last resort. Kapoor said the Indian Army had already "factored this" into its planning and there was "no cause for concern" in India.He said tension between India and Pakistan were "larger" in the aftermath of the Mumbai attacks, but said there was no need to create any hysteria. "We expect Pakistan to move some troops from FATA (Federally Administered Tribal Areas) to its eastern borders with India. They have come to eastern border of Pakistan with India," Kapoor told a press conference at New Delhi on Wednesday. "There is a larger amount of tension after 26/11. Because we feel that the perpetrators of 26/11 came from Pakistan. In view of that, we in India are keeping all options open," he said. Elaborating on the options, he said these were "diplomatic, economic, or as a last resort, a fighting option. 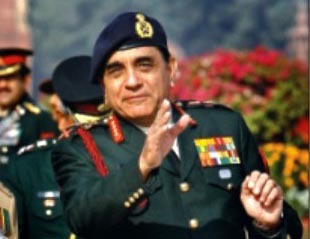 "Kapoor said, there was "no need to create any kind of hysteria"
On the use of military option as a last resort, Gen Kapoor said the decision was dependent on the political leadership when they felt that all other options, including international opinion, were exhausted. "Our political leadership has said war is not an option. But all options are open. The situation remains at that stage," he said to a query. Regarding reports of some strike formations of the Indian Army moving towards the western borders, Kapoor said some of the formations were currently carrying out exercise in both the Mahajan ranges and Pokhran ranges and that the information had already been shared with the neighbouring country. "It is part of an understanding that practice training be intimated. There has been some amount of clearing up of bunkers, which need to be maintained regularly. It need not become a cause for a war frenzy," the Army chief said. On the threat of nuclear arsenal from Pakistan falling into terrorists’ hands, Kapoor said, "I wish it doesn’t happen. "But, he said, if there was a degree of stability in Pakistan, this threat would not become a reality. "Nuclear weapon (in the wrong hands) is a cause for worry for the entire globe," he added.Asked if India, having helped Afghanistan to rebuild infrastructure, should get a strategic presence there to squeeze Pakistan, the General said it was for the political leaders to take a policy decision on the matter.